Apprentices at the UCSC Farm & Garden prepare organic vegetables and ornamental starts for the annual fall sale. Shorter days don’t mean the end of the Central Coast’s gardening season. Planting veggies, annual flowers, and perennials now will bring a bonus of fresh vegetables into fall and winter, and a bounty of blossoms next spring. 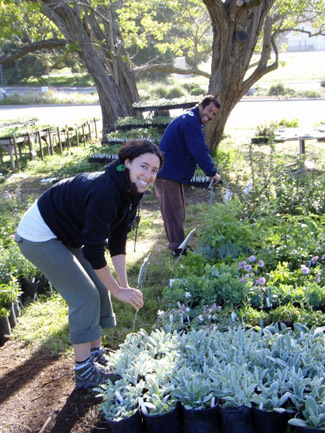 The UCSC Farm & Garden’s Fall Plant Sale offers a rich and timely selection of organically raised vegetable seedlings, perennials, and California natives. Sponsored by the Center for Agroecology & Sustainable Food Systems, the sale takes place on Friday and Saturday, September 9 and 10. The sale will be open from noon to 6 p.m. on Friday, and from 10 a.m. to 2 p.m. on Saturday, in the Barn Theater parking lot at the intersection of Bay and High streets in Santa Cruz. This year’s vegetable offerings include peas, spinach, kale, lettuce and salad mixes, Asian greens, chard, collards, fennel, and leeks, along with broccoli, cauliflower, cabbage, and Napa cabbage. There will also be a good selection of fall- and winter-flowering annuals, including sweet peas, bachelor’s button, statice, calendula, scabiosa, and stock. The Farm & Garden’s Fall Plant Sale is one of the largest all-organic events of its kind in the Monterey Bay Area. All of the flower and vegetable starts were propagated using organic methods. No chemical fertilizers, pesticides, or herbicides were used in growing the plants from seed and cuttings. In addition to winter vegetables, annual flowers and culinary herbs, the sale will feature perennial flowers and shrubs, including buddleias, lavenders, ornamental thistles and a wide selection of salvias. Autumn is also a great time to plant California native species. Available this year will be manzanitas, coyote bush, coast silktassel, and several Ribes varieties. For those who prefer to garden indoors, this year’s sale will also feature portable succulent gardens and terrariums, propagated from the UCSC Farm’s dryland garden. These low-maintenance miniature landscapes make a welcome addition to any office desk, dorm room, classroom, or sunny kitchen windowsill. Come early on Saturday for some breakfast treats. UCSC’s Community Agroecology Network will be on-site with fair-trade coffee from their Latin American community partners, and The Picnic Basket will have sweet and savory morning pastries. In the afternoon, The Penny Ice Creamery will be selling fragrant and delectable Fig Leaf Ice Cream made with fig leaves from the Farm Garden. Receipts from the plant sale presented at Penny the week of September 11th will also earn shoppers a 10 percent discount on any purchase. The sale will benefit the UCSC Farm & Garden Apprenticeship, a six-month training course in organic farming and gardening. Members of the Friends of the UCSC Farm & Garden receive a 10 percent discount on purchases; memberships will be available at the sale. For more information about the Fall Plant Sale or the Friends of the Farm & Garden, call (831) 459-3240, send email to casfs@ucsc.edu, or see http://casfs.ucsc.edu. The sale takes place rain or shine.